Give the gift everyone wants this holiday season. 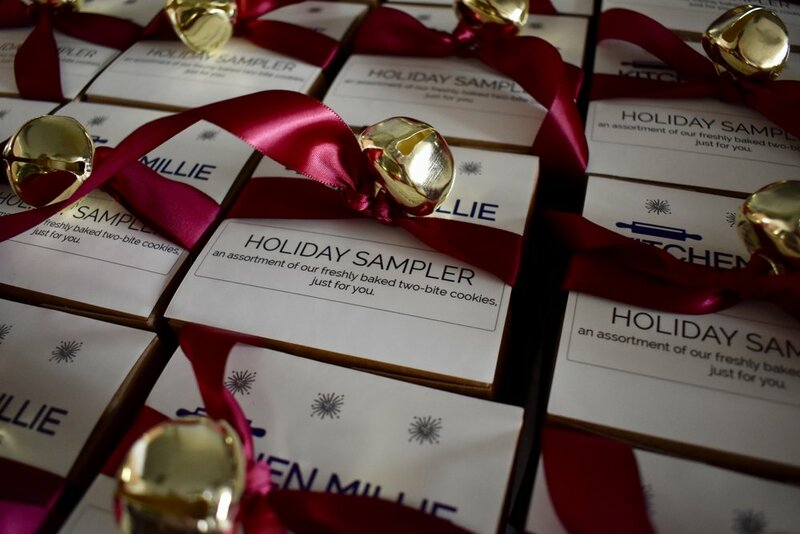 Here at Kitchen Millie, we can customize any gift box to showcase your company or brand in the best way possible! We're now accepting pre-orders for the 2018 Holiday Season. Please fill out the form, and we'll be in touch! Perfect for everyone in your office this holiday season. One dozen of our fresh from the oven, two-bite cookies, wrapped with a festive bow, jingle bell and note card (customize with any message!). Starts at $29/box. The best gift to give. Perfect for clients and teams! Two dozen of our fresh from the oven, two-bite cookies, packaged in a timeless box with festive bow and jingle bell. Includes a notecard that you can customize with any message. Looking for something a bit smaller? Try our Mini Cookie Gift Box. Hand wrapped gift box with five fresh from the oven, two-bite cookies finished off with a festive bow and jingle bell. Email us at hello@kitchenmillie.com or fill out the form below and we'll get back to you within 24 hours!